Good Faith & Fair Dealing* is an interactive sculpture based on the classic wooden maze game, Labyrinth. 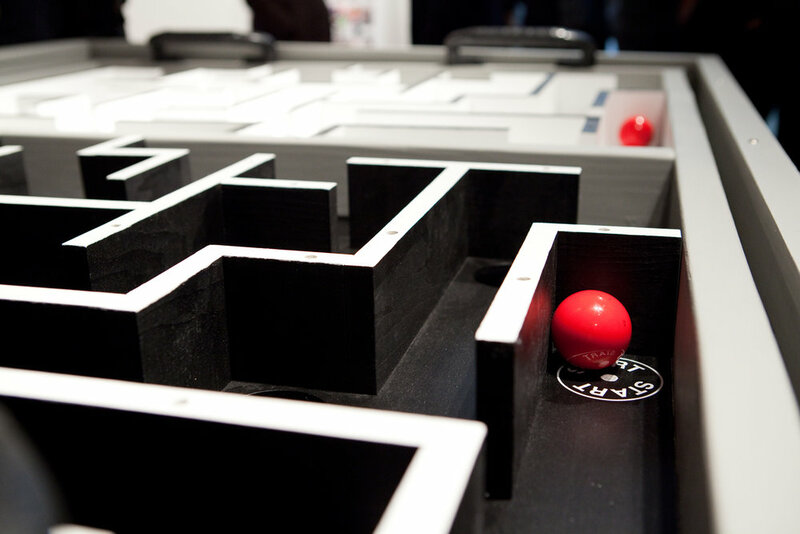 In the original game, the player tilts the game board in order to guide a marble through the maze without letting it fall into any of the holes in the playing surface. My version is larger in scale and is complicated by the addition of another player. The game surface is divided in half, with an identical maze and ball dedicated to each player. The players are situated at opposite ends of the board with equal control of the same tilting surface, so they must decide whether to work together to guide both balls to their respective goals, or to play individually as opponents with possibly competing agendas. * The title comes from the “implied covenant of good faith and fair dealing” in contract law “which requires both parties to treat the other party fairly and to give at least as much consideration to the other party’s welfare as it gives to its own” (Barron’s Law Dictionary (2nd ed. 1984), at 204).